Alternative health practitioners believe that by cleaning out the liver, the body will be rid of toxins that cause a variety of ills from digestive problems to weight gain to depression. A liver cleanse usually involves ingesting large quantities of liquids, such as organic apple juice and water, as well as eating a specific diet rich in fruits and vegetables. Other ingredients in the cleanse include Epsom salts and a mixture of olive oil and grapefruit juice. While this sounds healthy, there are side effects to the cleanse that need to be discussed with your health care practitioner before beginning a liver cleanse. Even though liver cleanses require drinking copious amounts of fluid, dehydration is still a side effect of the procedure. Some of the ingredients in the cleanse, such as Epsom salts, will increase urination and bowel movements. Many of the more benign side effects of a cleanse, including irritability and nausea, stem from dehydration. 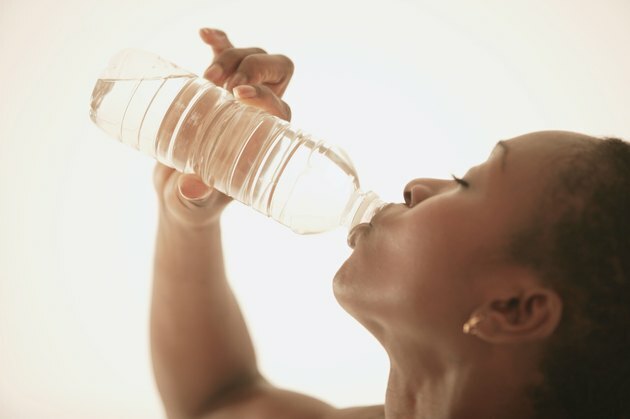 Make sure to drink lots of water if you're cleansing and to stop the cleanse if you feel lightheaded. Epsom salt (magnesium sulfate) is toxic in large amounts. Most liver cleanses will stay in a safe range, but don't go any higher than that, thinking that more Epsom salt will enhance the cleanse. It won't. Symptoms of an overdose, according to information at drugs.com, include vomiting, low blood pressure, muscle weakness, coma and death. The purpose of a liver cleanse is to rid the liver of toxins, usually in the form of gallstones--tiny pellets of balled cholesterol. Cleanse proponents report they expel hundreds of these tiny stones during a multi-day cleanse. A potential danger of the cleanse, though, is that the stones may become lodged in the small ducts and canals that lead from the liver through the gall bladder and into the intestines for expulsion. If you experience sudden, severe pain during a liver cleanse seek immediate help as this is an indication that a stone is stuck and will need to be removed. Liver cleanses will introduce people to foods and drinks they have not had before and that may cause allergies. If during the cleanse you feel any tingling in your mouth or lips, have an itchy throat or feel swelling in the tongue, mouth or throat, immediately stop the cleanse and seek medical attention.